An easy to cleanup wood glue that is designed for exterior use. Titebond II Premium Wood Glue is a one-part wood glue that passes the ANSI Type II water-resistance specification, and is ideal for exterior woodworking projects; including outdoor furniture, birdhouses, mailboxes, planters, and picnic tables. Titebond II Premium provides a strong initial tack, fast set speed, superior strength, and excellent sandability. It is FDA approved for indirect food contact (cutting boards), and is ideal for radio frequency (R-F) gluing systems. *Chalk temperature indicates the lowest recommended temperature at which the glue, air and materials can be during application, to assure a good bond. Minimum required spread: 6 mils (typical), or 250 square feet per gallon. Methods of application: Plastic bottles for fine applications; glue may also be spread with a roller spreader, or brush. Cleanup: Damp cloth while glue is wet. Scrape off and sand dried excess. 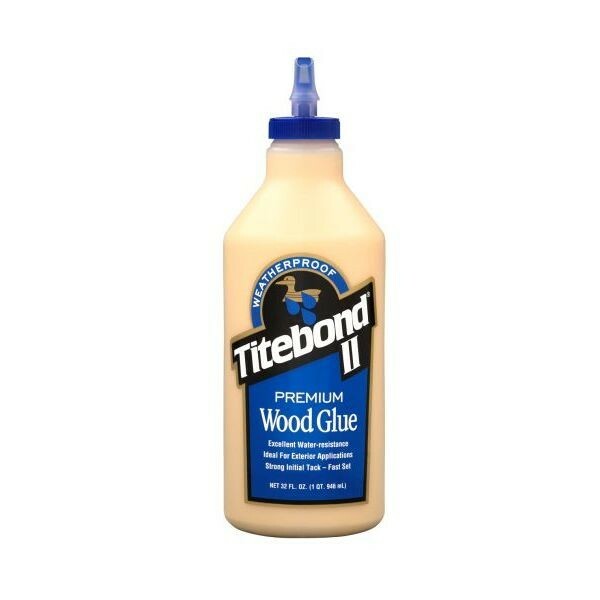 Titebond II Premium Wood Glue is not for continuous submersion or for use below the waterline. Not for structural or load bearing applications. Do not use when temperature, glue or materials are below 55°F. Freezing may not affect the function of the product but may cause it to thicken. Agitation should restore product to original form. Because of variances in the surfaces of treated lumber, it is a good idea to test for adhesion. For best results gluing exterior doors or exotic and oily woods, please contact Titebonds Technical Support Team at 1-800-347-4583. Read MSDS before use. Keep from freezing. Keep out of reach of children.